Thinking about sprucing up your backyard? Read this. A little bit of hard work during the cooler months can make all the difference come summer time. Winter is the perfect time to be thinking about giving your outdoor space or yard a spruce up so it is ready to be enjoyed once the weather warms up. Elizabeth McIntyre, CEO of Think Brick Australia, says clay and concrete pavers are a great outdoor design option as they are hard wearing, require very little, if any, upkeep and also come in a range of sizes, colours and designs to create inspired outdoor living spaces. Incorporating different levels can be practical in helping to landscape a sloping area, but it can also add dimension, movement and interest to spaces. Just like in this garden courtyard which uses levels to invite you to stop and rest. The slimline brick paving creates warmth, texture and the illusion of increased space. Mixing different elements and materials can give outdoor spaces not only added interest but a unique perspective. In this 60s Modernist courtyard inspired space, sculpted timber, clay and concrete bricks, plus metal artwork combine to convey a wow factor within a confined space. Using bricks and pavers to create unexpected visual designs is a new spin on the feature wall trend – adding texture, impact and warmth to a space. This example used in an inner-city apartment courtyard is designed to respond to shadow movements and provide a rich backdrop with layered depth to enhance perspective. 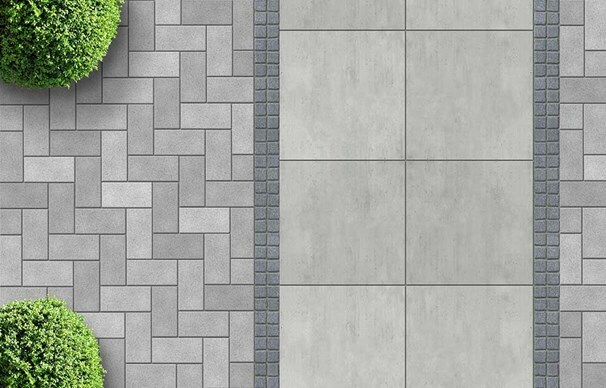 Written by Elizabeth McIntyre, as seen in https://www.bhg.com.au/article/renovating/outdoor-paving-trends July 2017.